Margaux Resources Announces Surface Rock Sample Results from its Bayonne and Jackpot Properties and Prepares for a 2,000 Metre Drill Program | Energy and Gold Ltd.
Margaux Resources Ltd. (TSX VENTURE:MRL, OTCQB:MARFF) (“Margaux” or the “Company”) is pleased to announce the results from initial surface rock sampling on the Company’s Bayonne and Jackpot properties, located within the Kootenay Arc Project near Salmo in Southern British Columbia. The results include high gold assays from grab samples of up to 27.5 g/t Au on the Bayonne and widespread zinc mineralization at Jackpot including 20.8% Zn from Jackpot Main. Highlights are summarized in the table below. High gold assays on the Bayonne property were returned from samples collected along 900 metres of strike on the Main Vein. Grab sample results include 27.5, 23.3, 18.1, 15.0 and 10.6 g/t Au as well as anomalous silver, zinc, lead and tungsten. The Bayonne property hosts several high-grade, steeply dipping gold-bearing orogenic quartz veins hosted by granodiorite. Historic production was from the Main Vein and from the A Vein splay (mainly from the period 1936-1945), and totalled approximately 82,000 tonnes, at an average grade of 16 g/t Au. Despite the previous mining within the Main workings, early observations have identified an undeveloped auriferous splay vein. The Company’s modelling of historical work has provided strong indications for an extension of the Main Vein to the east on the unexplored ground between Bayonne and Margaux’s high-grade gold Maggie Aiken’s prospect. In addition to several other underexplored vein systems known on the Bayonne property that Margaux will be investigating in 2017, the Bayonne Project readily supports the potential discovery for new veins. On the Jackpot property, 18 km northwest of Bayonne, work has confirmed widespread zinc mineralization in outcrop and in historic exploration pits and trenches. Results from Margaux’s initial surface rock sampling include 20.8% Zn from Jackpot Main, 16.3% Zn from Jackpot West, and 12.7% Zn from the Lerwick zone. The Jackpot property, encompassing the Jackpot Main, East, West and Lerwick lead-zinc occurrences, has benefitted from significant historic exploration between 1949 and 1981 including a major 5-year program from Cominco Ltd. from 1973-77. Past operations entailed approximately 2,000 m of underground workings and 143 surface and underground drill holes totalling more than 11,000 m.
The Company has compiled all the available historic data and produced a 3D model of the Jackpot East mineralization (refer to the Company’s website for a visualization) which trends 600 m roughly north-south and remains open along trend. “The Jackpot property is one of those rare instances where a company such as Margaux inherits and is able to capitalize on over 30 years of advanced exploration with the property remaining pristine and unexploited. 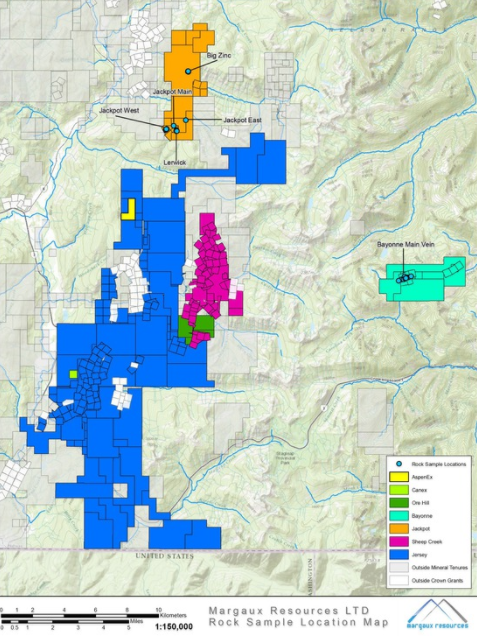 There is every indication to expand the known zone of lead-zinc mineralization and this is just one occurrence in the Company’s Kootenay Arc portfolio,” stated Tyler Rice, President and CEO. Signifying the length potential of the high-grade mineralization, results of 5.95% Zn were also returned from Big Zinc, 3 km along strike of the Jackpot trend to the north (refer to Company news release dated June 28 detailing the stand-alone Zinc potential for the Big Zinc zone). Of keen interest at Big Zinc is the presence of elevated gold (0.36 g/t Au) from a broad zone of stockwork quartz veinlets cutting zinc-mineralized limestone. “This is not the only newly identified occurrence of gold in the zinc mineralization within the Company’s Kootenay Arc Project. Gold was historically overlooked, not analyzed for and not recovered; representing a significant additional dimension to the Kootenay Arc Project for both the mineralization in the ground as well as the existing tailings facility,” stated Tyler Rice, President and CEO. All existing data from the Jackpot and Big Zinc zones is being compiled into a 3D computer model. This will be used to assist in target identification for an upcoming 2,000 m drill program, due to commence in mid-August 2017. Most of the results listed in the above table are grab samples. Where possible, systematic chip sampling of these zones has now been completed to provide a better understanding of true width and average grade to zones of mineralization. Results for the systematic chip samples are expected in late-August 2017. Rock samples were grab samples collected from outcrop, float or from the dumps of historic workings. Grab samples are designed to show the presence or absence of mineralization, and results are not necessarily indicative of average grade. Sample weight was variable depending on interval, ranging from approximately 1.5 kg – 8 kg and averaging about 4 kg. QA/QC procedures were implemented in the drilling program and included Company-inserted standards of known gold and lead-zinc grade. Samples were shipped to ActLabs’ Kamloops, B.C. laboratory (ISO 9001:2008, ISO 17025, CAN-P-1579 certification) for preparation and analysis. Samples were crushed at the laboratory to 80% passing a 10 mesh (2 mm) screen, then a 250 g split of the crushed sample was pulverized to 95% passing 105 microns. All samples were analysed for gold by FA/AA finish on a 30-gram sample of pulverized material, and for a multi-element suite by ICP-MS following aqua regia digestion. For samples returning > 10 g/t Au by FA/AA finish, samples were re-analyzed using FA/gravimetric finish. Linda Caron, M.Sc., P.Eng, Margaux’s Vice President of Exploration, is the Company’s Qualified Person as defined by NI 43-101 who supervised the sampling program and who has reviewed and approved the technical information contained within this press release. Margaux Resources Ltd. (TSX.V: MRL, OTCQB: MARFF) is a mineral acquisition and exploration Company focused on the development of zinc, gold and tungsten deposits in the Kootenay Arc, in the southeastern region of British Columbia. The Company is directed by a group of highly successful Canadian business executives and has a fast-growing portfolio of previously producing properties that include the Jersey-Emerald mine, which at one point was the 2nd largest historic zinc-lead mine in B.C. and the second largest tungsten mine in North America. This press release may contain forward looking statements including those describing Margaux’s future plans and the expectations of management that a stated result or condition will occur. Any statement addressing future events or conditions necessarily involves inherent risk and uncertainty. Actual results can differ materially from those anticipated by management at the time of writing due to many factors, the majority of which are beyond the control of Margaux and its management. In particular, this news release contains forward-looking statements pertaining, directly or indirectly, to the following: Margaux’s exploration plans and work commitments, the receipt of required regulatory and other approvals, and the Company’s business and operations strategies. Readers are cautioned that the foregoing list of risk factors should not be construed as exhaustive. These statements speak only as of the date of this release or as of the date specified in the documents accompanying this release, as the case may be. The Company undertakes no obligation to publicly update or revise any forward-looking statements except as expressly required by applicable securities laws.